We gave you a teaser about this a couple weeks ago... it's finally almost almost here... King of Scratch @ Emo's on May 4th. Check out the competition... go Austin! SuperStarDjs in conjunction with Romeo Navarro's B-Boy City will be hosting the first annual King of Scratch DJ Battle on Friday, May 4th, during B-Boy City 14. B Boy City is the countries premiere B Boy showcase. Current DJ competitions have swayed from this fundamental element. King of Scratch intends to take it back to hip hop’s roots and showcase the pure genius of the Scratch! As the B Boy Event expands SuperStarDjs will be hosting a DJ battle designed to showcase the DJ elements most fundamental skill, the scratch! Whether it was DJ DXT on “Rock It” or DJ Jazzy Jeff on “The Magnificent”, we have all been memorized by the endless combination of coordinated fader and record movements. The contest is open to all scratch DJ’s from around Texas and beyond. Judging will be based on originality, creativity & most importantly the scratch. 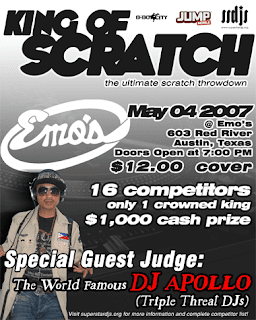 We are currently coordinating with some special guest DJ's to judge the competition and determine the 2007 King of Scratch. Registration for the King of Scratch is free of charge. The contest is for solo DJs only, no teams will be permitted to compete.